We have recently introduced a set of constants in the calculator. 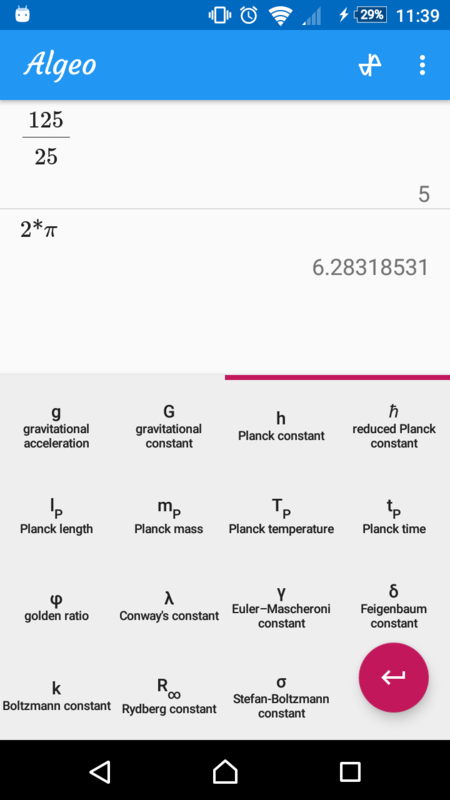 These covers a range of different numbers from as simple as the speed of light to the Planck constant. Now you can quickly type in your calculations, no need for looking up those numbers on Wikipedia anymore! 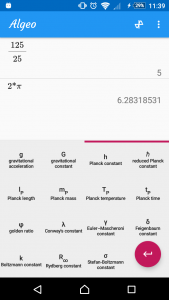 The constants includes physical numbers, such Newton’s gravitational constant, chemical constants, such as the Avogadro number and your usual mathematical constants like e or pi. In total, there are 29 of them. One word of caution: there are three variables in Algeo you can store numbers in. Up until now, they were called a, b and c. However, the new speed of light constant is also called c, so we had to remove it as a variable. To still have three variables, we added a new one called d. So from now on the variables you can use are a, b and d! Share your solutions with others!